Palermo’s Pizza was about to launch a new face for their “Primo” thin crust pizzas. They had their initial packaging design down, but they still needed deep customer insights for additional finesse and refinement. 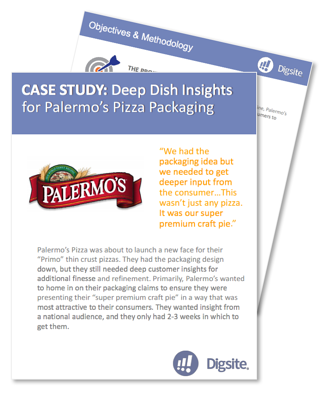 Traditionally, Palermo’s would conduct in-person focus groups, but with only 2-3 weeks left before launch, they did not have the time or budget to conduct focus groups, so they turned to Digsite Sprints for fast consumer insights. Palermo’s set out to validate their packaging design and claims with consumers to ensure the messaging was optimized for their audience.